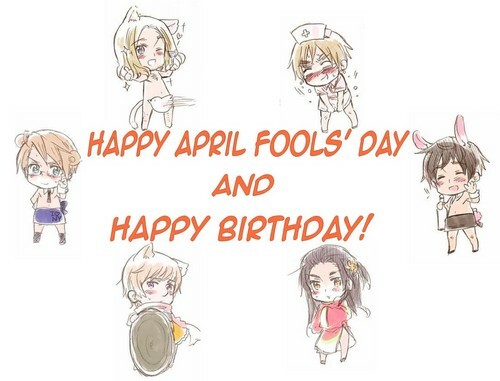 HAPPY BIRTHDAY, APRIL FOOL KID!!!!!. Happy birthday, Yoki-chan!. HD Wallpaper and background images in the Hetalia club. This Hetalia photo might contain سائن ان کریں, پوسٹر, متن, چاکبورڈ, نشانی, تختۂ چاک, ڈاؤن لوڈ ہونے والے, مزاحیہ کتاب, منگا, کارٹون, ہالی ووڈ, and کامک بُک. Tine: *with a very sad look on her face, near tears* What is it? Me: *grabs Tine by the collar of her shirt, with a serious/sad face* .................. April Fools! Me: Gotcha, didn't I? Just kidding I really like it. Talk about a present! Tine: Huh? What do you mean? Ren: *yelling from across the HQ* She's turning 17! NOT GOING TO A BACHELORETTE (hopelessly spelled that wrong...) PARTY!! !